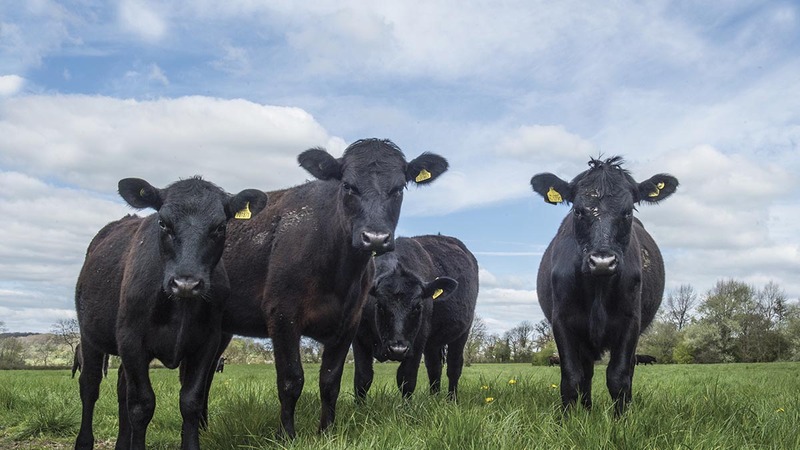 Ahead of him speaking at this year’s Grassland and Muck seminar on increasing beef production per hectare, Laura Bowyer catches up with Matt House. Matt House’s methods of suckler beef production are as close to a low-input, New Zealand-style dairy system as you could get, without milking the cows. He was quick to make improvements to the 198-hectare (490-acre) Bowden Farms, owned by the de Pelet family, when taking on the role of farm manager in 2014. At this point, stock consisted of 25 cross-bred suckler cows, 10 pedigree Angus cows and a group of 30 steers and 30 heifers. Mr House says the asset value was particularly low due to the lack of stock, so he set about trying to increase it. There was also a shortage of fencing, which he started to improve along with quality of grassland, with the help of the farm’s workman Terry Boulton. Mr House says: “Soil indices, particularly P and K, were at rock bottom, and soil structure had been destroyed. 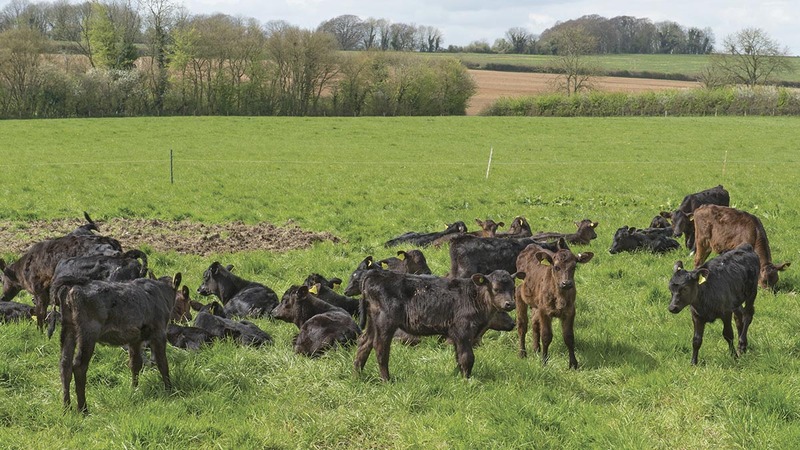 These days, Mr House relies on his soil and grass nutrient levels to produce store cattle without the aid of concentrates, running a rotational grazing system based on leys, consisting of five varieties of ryegrass, three white clovers and Timothy. Operating just into Somerset on the Dorset border, there are many New Zealand-style dairy farms in the area, and calves of the Angus sweeper bulls make up the basis for the farm’s suckler system. Grassland has been split into 2ha (five-acre) paddocks and its growth is measured weekly. Mr House says a lactating cow requires 15-16kg DM per day, while dry cows need 10kg DM per day. All silage is baled as excess grass is cut throughout the season. Although there is in no shortage of shed space, cattle are out-wintered. Mr House buys-in week-old Angus-sired heifers out of Kiwi-Friesian cross Jersey cows. 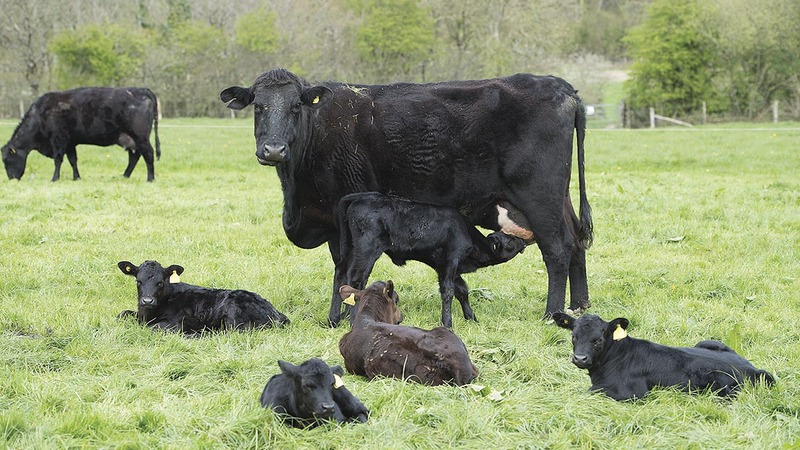 These grow into small, milky mothers, which are then put to an Angus bull at 14 months, if more than 280kg, to produce suckled calves. When buying-in these dairy heifer calves, he pays £80-100, and says they will cost another £100 to wean at about 100kg. Calves are trained on teat feeders inside and fed twice-a-day until three weeks old. They are then moved to grass where they are fed milk from a quad-bike drawn ‘milk-bar’. Weaned calves are kept in paddocks in batches of 40. Suckled calves are weaned at the end of November, with steers leaving the farm at nine months old. Heifers are outwintered to be sold the following spring at 12 months old. The practice of fence-line weaning is used with all suckled calves, where calves are put on one side of the electric fence and cows the other, maintaining a level of cow-to-calf contact to decrease stress, aimed at reducing the dip in calf growth rates at weaning. Mr House works to get as much from his pastures as possible. Cattle are weighed at least once a month, with the aim of increasing output of kg of beef/hectare. Keeping Angus crosses for the sire premium, stores produced from suckled calves are sold to Farmark, which supplies cattle to Dovecote Park and, ultimately, Waitrose. Mr House says cattle were deficient in selenium and copper due to the combination of the natural soil type and prior management of the ground and its grass. Now, breeding heifers and cows are given a fertility bolus twice a year. He says: “Cows have to be productive, maintaining calf as well as body condition. Smaller framed, efficient animals enable more cows to be kept, increasing live units/hectare. “A 500kg cow is plenty big enough. 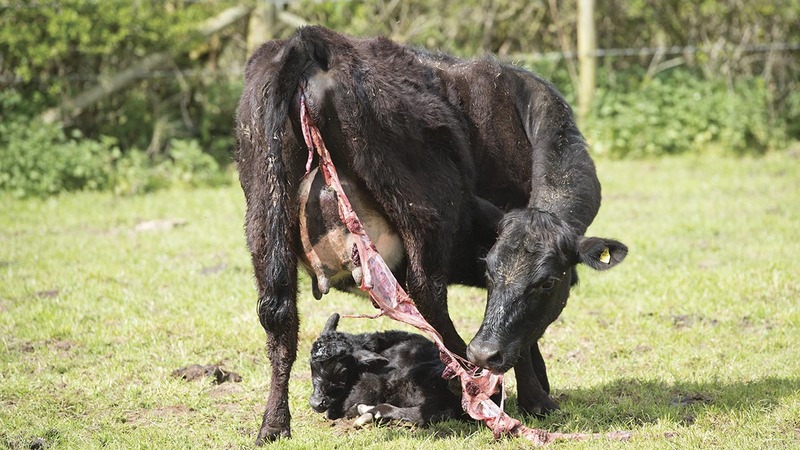 I am not prioritising calving ease when assessing estimated breeding values, as Angus are naturally easy-calving. Dry cows are fed hay and straw and Mr House says this is all they need for maintenance, with 200 bales of hay and 100 of straw made last year, alongside 300 bales of grass silage. All cows are calved in a 10-week period. Anything not in-calf after nine weeks of running with the bull leaves the farm, as Mr House says the most expensive part of the system is keeping the cow. Cows calve outside, where calves are then tagged and ringed, with cows so docile Mr House can handle the calves infront of their mothers. Mr House has 90 heifers which will join his breeding herd next year. A further 70 heifer calves brought in this spring will enter the heard in 2019 and, thereafter, he will buy in 30-40 calves as replacements each year. He says: “I am trying to get numbers up to 300, then the system will become much more cost effective in relation to labour units and rent. Last year, 18ha (45 acres) of stubble turnips were grown with hay and straw placed in situ across the field ready for each move of the fence. Mr House says last year this acreage of turnips with 200 bales of hay and 100 bales of straw was enough to keep his 120 cows over a 100-day winter period. All youngstock are outwintered by using differed grazing and baled silage. Grass is measured when placing silage bales out in late autumn. By knowing the cover of dry matter, along with dry matter and weight of bales, Mr House can work out the area needed for these cattle each day and through winter. Matt House aims to finish his first round of rotations by ‘magic day’, where grass growth exceeds stock demand, and he is hoping for 10 rounds of his 31 paddocks this year. Once every paddock has been grazed at the start of the year, cattle are moved within three days depending on growth rate of grass. Fertiliser is applied to each paddock upon removal of the stock. The first paddock rotation commences around the middle of February for youngstock and the first week of March for cows. Last year, cattle ate 85 per cent of the 10.16 tonnes of dry matter grown on the grazing platform, with a relatively low level of nitrogen applied. Mr House aerates grass which has been trodden in autumn and spring, but does not chain harrow, as he says cows do not allow any dead waste to build up. Agrinet, an Irish farming computer programme, is used to record grass growth, alongside cattle weights. Mr House uses a plate meter every Tuesday to measure grass growth and enter it into the system. He says: “Taking part in the AHDB Beef from Grass Project has enabled to me to build a strong foundation of knowledge in this field, through practice and link-working with experts in the industry.